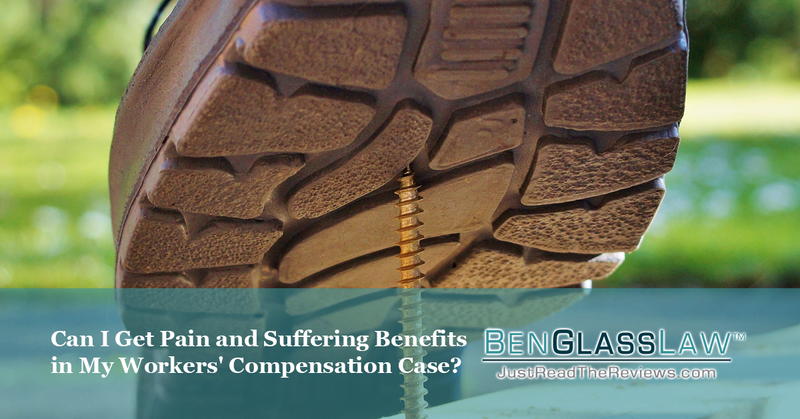 Can I Get Pain and Suffering Benefits in My Workers' Compensation Case? In this interview with the Injured Workers Law Firm founder Michele Lewane and I discuss pain and suffering in a workers' compensation claim. It is likely that any individual filing a workers' compensation claim has felt pain and suffering. An on-the-job injury not only causes the obvious physical pain that may be permanent, but it also causes severe emotional distress caused by financial strain. An injury may prevent the employee from ever working again and if he or she does work again it will be at a different job with likely lower wages. Workers' compensation benefits are not meant to provide the same long-term standard of living you were accustomed to. In a personal injury case, the physical pain and emotional distress would lead to pain and suffering compensation. But in a workers' compensation claim injured workers cannot receive pain and suffering benefits. This is because before workers' compensation laws were enacted, pursuing benefits as an injured worker was a more complex, lengthy, and expensive process. Because the process in itself caused suffering for the injured worker, there has been a compromise to provide benefits through a much simpler process. One consequence of the new laws is that those pursuing a workers' compensation claim can no longer receive pain and suffering benefits. While filing a workers' compensation claim there is one injury that can receive benefits similar to pain and suffering. Permanent partial disability benefits can be received if the employee permanently loses the use or partial use of a body part. Depending on which body part is injured, the injured worker will receive a disability rating and then receive compensation for the permanent loss of function. This is not the same as pain and suffering compensation, but it as close you are going to get with a workers' compensation claim. A third-party personal injury claim can receive pain and suffering compensation. This is not a workers' compensation claim. This is when a third person's negligence contributed to the injury. A common example of this type of claim is when the equipment used that caused the injury is proven to be faulty. Because this is a personal injury claim against the equipment manufacturer and not a workers' compensation claim against the employer, pain and suffering compensation can be received. Pursuing this course of legal action successfully will result in more money than in a workers' compensation claim, but it difficult to do without an attorney.